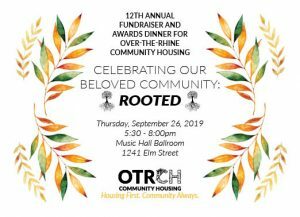 Over-the-Rhine Community Housing presents Celebrating Our Beloved Community: Rooted. Through this theme we will explore the depth of our organization’s roots and the roots of the individuals, businesses, and organizations who have called Over-the-Rhine home for generations. Stories will be shared with us that elevate the value of being rooted in such a vibrant and diverse neighborhood. We will present the ‘Building Our Beloved Community’ awards to partners who have played a significant role in helping us achieve our vision of quality stable housing for all in a socially, racially, and economically inclusive community. This year we will honor Peaslee Neighborhood Center, the Greater Cincinnati Homeless Coalition, and Bonnie Neumeier. If you are interested in sponsoring this year’s event, please email cdaugherty@otrch.org. 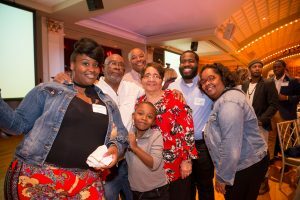 Every Fall, we gather with over 300 of our dearest friends, partners, and supporters at Celebrating Our Beloved Community, a fundraising and awards dinner honoring the many varied voices that make up our beloved community. The 11th Annual fundraiser took place on October 11, 2018 at the beautiful Music Hall Ballroom. We tried something new and incorporated a special theme: OTR’s Got Talent! We showcased community arts organizations including MUSE, SCPA’s Meridian 8 a cappella ensemble, Elementz and local poet/spoken word artist/activist Siri Imani. We also hosted a silent auction so guests could bid on unique items created by artistically-talented OTRCH residents! Proceeds from this silent auction were split between OTRCH and the artist. Guests had the opportunity to bid on gorgeous homemade jewelry, impressive paintings and more! Click here to check out these gorgeous pieces and learn more about the artists! 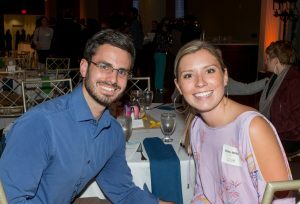 Our guests had a blast celebrating the artistic talent that exists in our neighborhood and highlight how art has the ability to connect and strengthen our community in unique ways. Click here to check out the photo album on Facebook! 2018 Building Our Beloved Community award recipients were Cincinnati Development Fund and Georgia Keith! We present the “Building Our Beloved Community Award” to an individual and an organization that have played a significant role in helping us achieve our vision of quality stable housing for all in a socially, racially, and economically inclusive community. Click here to see a list of past award recipients. We are grateful to the following organizations that provided major support to OTRCH in 2018: Ohio Capital Corporation for Housing, PNC Bank, Zillow Group, 3CDC, J-RAB, First Financial Bank, Parking Lot Management of Cincinnati, Miami University Center for Community Engagement in Over-the-Rhine, Schmidt Heating and Cooling, Sisters of Charity, The Marianist Province of the United States, RiverHills Bank, US Bank, Cincinnati Development Fund, Impact Services, Franciscan Friars – Province of St. John the Baptist, VonLehman CPA & Advisory Firm, City Studios Architecture, Model Group, Fifth Third Bank, Tidwell Group, Snowball Pest Control, John Hueber Homes and Patty Hord. Each year at this event, we seek a different “lens” through which we can view Over-the-Rhine. We’ve explored the meaning of “community” from the perspective of experts, both local and national. We’ve turned to the voices of our neighborhood, presenting them with the unique weaving of a story teller. In 2017, we heard testimonies from residents, neighbors, and staff about how their lives have been touched by Over-the-Rhine Community Housing and the significance of community. Check out these videos we shared in 2016: Todd’s Story and Angie’s Story.